•	October 24, 2014 – October 26, 2014. ‘The exhibition of the wedding dresses.’ Vilnius Town Hall, Vilnius, Lithuania. •	February 6, 2016 – March 8, 2016. ‘Two hundred years of Wedding Gowns fashion.’ TC Ozas Department Store, Vilnius, Lithuania. •	June 1, 2016 – September 18, 2016. ‘Wedding Gowns 1860–2010. From the collection of Alexandre Vassiliev.’ Ventspils museum (The Castle of Livonian Order), Ventspils, Latvia. •	November 21, 2017 – January 31, 2018. 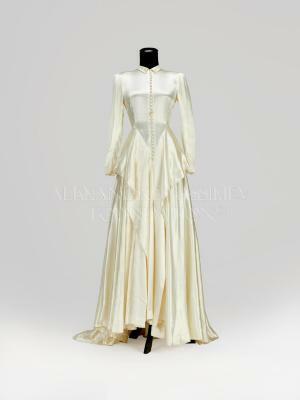 ‘The wedding fashion from Alexandre Vassiliev foundation.’ ‘Ausros’ museum Chaimas Frenkelis Villa, Siauliai, Lithuania. •	March 1, 2018 – June 30, 2018. ‘The Wedding Fashion from Alexandre Vassiliev foundation.’ Castle Fall, Keila-Joa, Estonia.